... one resource-intensive memory-shuffling operation done on pre-paged versions of ITS, WAITS, and TOPS-10 was sardonically referred to as "The Big BLT". It was later moved onto a PDP-10 and, sometime around 1970, a paging system was installed and ITS was modified to use virtual memory. The MIT Dynamic Modeling group adopted ITS for their PDP-6 and PDP-10 (named MIT-DMS). Initially, there was no disk to provide swapping store, so they ran a non-paged ITS until around 1973. 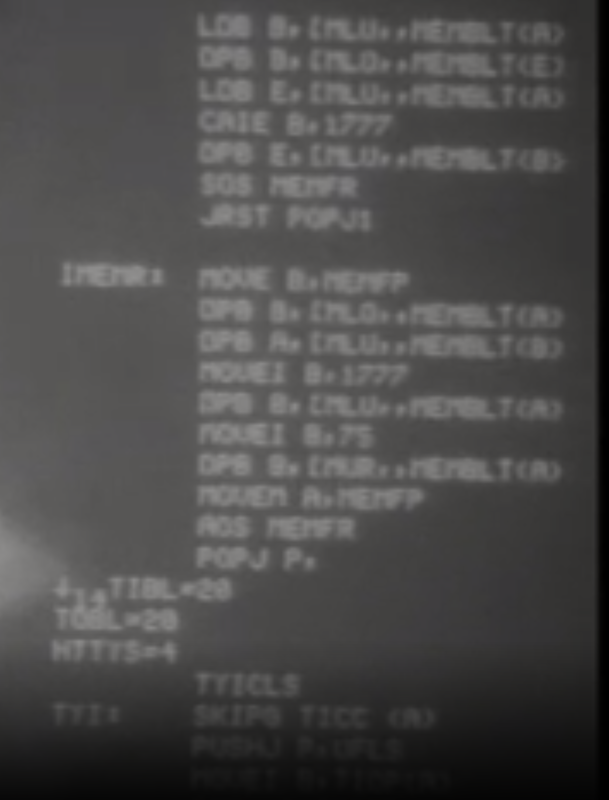 There is a copy of ITS for MIT-AI and MIT-ML (but not MIT-DMS) from 1973, but there is no trace of support for running on a PDP-6 or any possibility of running without virtual memory. I believe the majority of software development in the non-paging era was done using DECtape so, if an pre-historic ITS was to be found, it would probably be on such a tape. Another possibility is paper tape, since this was often used to load software for booting. Does anyone know where this (a non-paging ITS) could be found? This is a frame from MIT AI film #43. I'm not sure what year it's from, but it seems to be from the PDP-6 era. The code is very similar to old ITS source code, so it's likely this is a tiny fragment of PDP-6 ITS. The use of "↓₁₄" identifies this as text displayed by PDP-6 TECO. Not the answer you're looking for? Browse other questions tagged software dec pdp-10 pdp-6 or ask your own question. What is the FPD bit on the PDP-10? What are the differences between the various 36-bit computers from DEC?